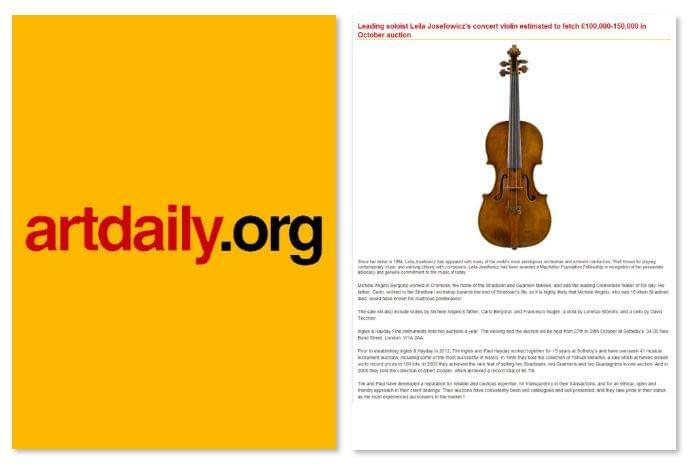 LONDON.- Ingles & Hayday announced they will be selling a violin by Michele Angelo Bergonzi which has been the concert instrument of leading soloist Leila Josefowicz for the last 12 years, in their auction on Tuesday, October 29, 2013 in London. It is estimated to fetch £100,000-150,000. Since her debut in 1994, Leila Josefowicz has appeared with many of the world’s most prestigious orchestras and eminent conductors. Well known for playing contemporary music and working closely with composers, Leila Josefowicz has been awarded a MacArthur Foundation Fellowship in recognition of her passionate advocacy and genuine commitment to the music of today. The link below shows Leila playing the Bergonzi at the premiere of a new concerto which was written for her by the conductor and composer Esa-Pekka Salonen. http://www.youtube.com/watch?v=oP4ru49dUlM Michele Angelo Bergonzi worked in Cremona, the home of the Stradivari and Guarneri families, and was the leading Cremonese maker of his day. His father, Carlo, worked in the Stradivari workshop towards the end of Stradivari’s life, so it is highly likely that Michele Angelo, who was 16 when Stradivari died, would have known his illustrious predecessor. The sale will also include violins by Michele Angelo’s father, Carlo Bergonzi, and Francesco Rugeri, a viola by Lorenzo Storioni, and a cello by David Tecchler. Ingles & Hayday Fine Instruments hold two auctions a year. The viewing and the auction will be held from 27th to 29th October at Sotheby’s, 34-35 New Bond Street, London, W1A 2AA. Prior to establishing Ingles & Hayday in 2012, Tim Ingles and Paul Hayday worked together for 15 years at Sotheby’s and have overseen 41 musical instrument auctions, including some of the most successful in history. In 1999 they sold the collection of Yehudi Menuhin, a sale which achieved sixteen world record prices in 100 lots. In 2003 they achieved the rare feat of selling two Stradivaris, two Guarneris and two Guadagninis in one auction. And in 2008 they sold the collection of Albert Cooper, which achieved a record total of $5.7m. Tim and Paul have developed a reputation for reliable and cautious expertise, for transparency in their transactions, and for an ethical, open and friendly approach in their client dealings. Their auctions have consistently been well catalogued and well presented, and they take pride in their status as the most experienced auctioneers in the market.